Buttermilk and lassies are the main beverages consumed through out India to reduce heat during the summer days. The reason being, that it reduces the body heat and is really an easy to prepare drink in a seconds. There are many variations available with the buttermilk drink such as plain ones, spiced ones, also those with added flavours such as fruits and veggies. 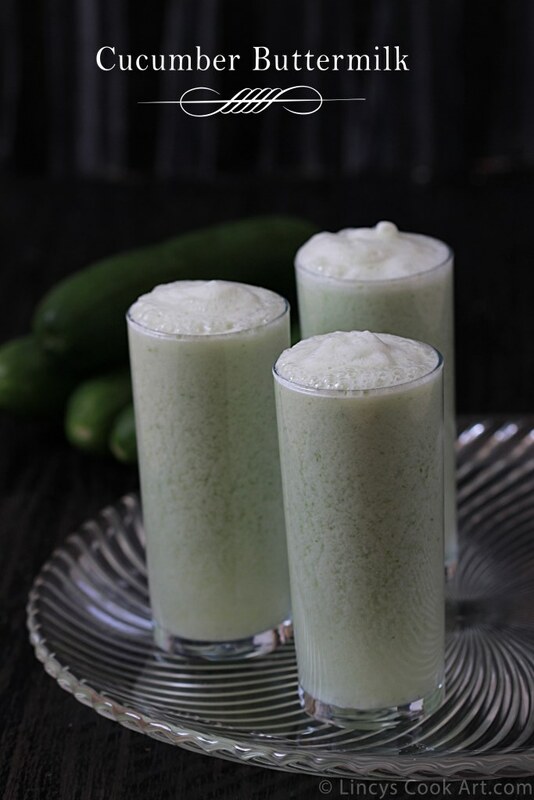 One such variation is cucumber buttermilk which i prepared last summer and became our family's favourite drink. It is absolutely easy to make and really tasty; super cooling with the goodness of cucumber. I used to make a mild variant each week in this drink by changing one or two ingredients. One of the days I would add one or two small/peal of onion, while on the other I would add coriander leaves, roasted jeera powder or chat masala. You could alter your cucumber drink by adding your spice or herb of choice. In a blender jar add the roughly chopped cucumber, green chilli, ginger, coriander leaves and yogurt; blend well to make a coarsely ground paste. Add water to dilute the mixture around 2 cups with required salt; blend well for fifteen to thirty seconds to make a frothy buttermilk. Serve chilled in glasses by sprinkling roasted jeera powder on top if you wish. Note: Use cucumber and yogurt straight from fridge so that the drink would be chill when u consume. You could replace yogurt with buttermilk and add less water while blending. For variation add herbs and spices of your choice like coriander leaves, pepper powder. Peel the cucumber if you does not like the taste of it. You could add a teaspoon of powdered oats too for making the drink more healthy.